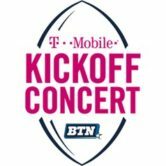 Join T-Mobile and Big Ten Network for the inaugural T-Mobile BTN Kickoff Concert on November 30th. This FREE concert will take place at The Pavilion at Pan Am Plaza (201 S. Capitol Avenue) in downtown Indianapolis. Note that this is a FREE SHOW and capacity is limited, so register NOW. To hold you over until the concert begins, check out neighboring Georgia Street (between Capitol Ave. and Illinois St.) starting at 6 p.m. ET. The open-to-the-public pre-show tailgate will include: a live band, DJs, interactive games, Kickoff Concert ticket giveaways, plus food and beverage options.